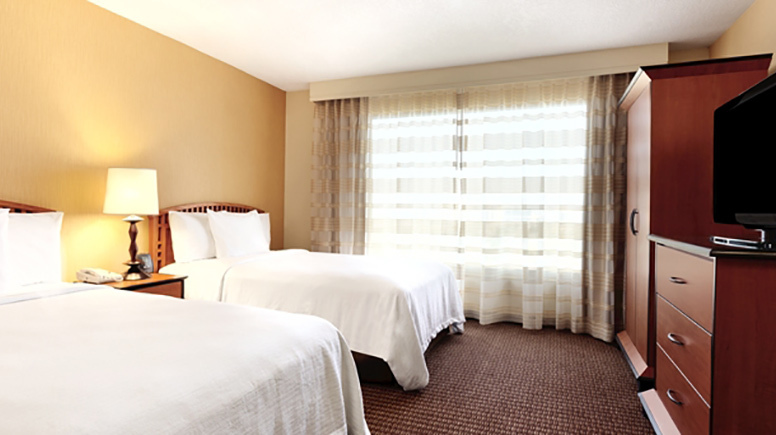 Located one (1) mile from the DISNEYLAND® Resort, this is the closest Embassy Suites to the DISNEYLAND® Resort. This safari themed hotel has an atrium with ponds, greenery, and bridges with live koi fish and turtles. Kids will especially love the animated life-size lion that sleeps atop a rock in the atrium and “wakes up” each hour with a roar. Enjoy a complimentary full breakfast buffet complete with cook-to-order items and free snacks and drinks at the manager’s receptions. We’ve stayed at a lot of Embassy Suites and we always love the cook to order breakfast! Love the omelettes, wish I could have this at home. always searching for a nice hotel and this is it. nice ambiance and friendly helpful employees. had a great stay. nice rooms, great breakfast, free snacks and drinks happy hour. 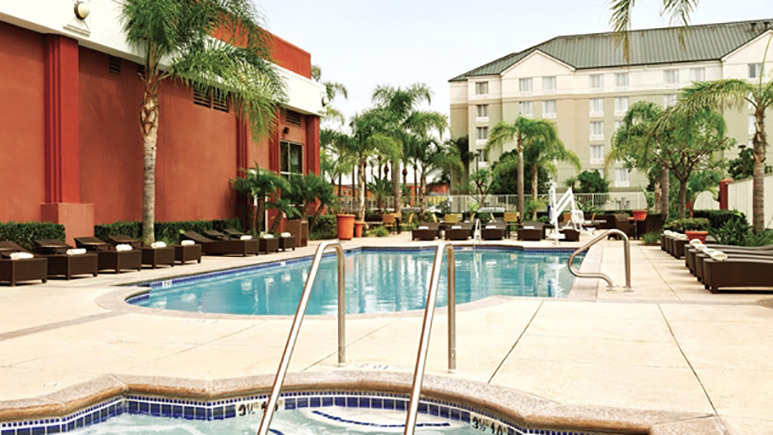 This is a great hotel for families at a great price for the amenities. 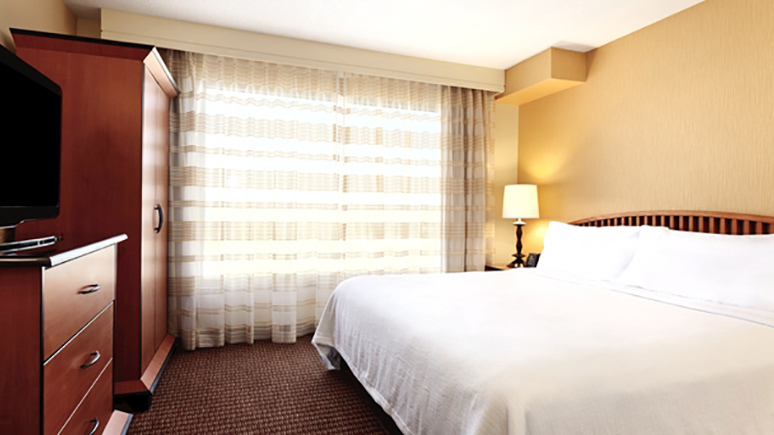 Our room was clean and spacious, our refrigerator worked great and our mini bar area was great for our snacks. The dining table was great for the days we ate in our room. The staff at the morning breakfast were all very nice with great selections and the omelet station was a plus, they even made over medium eggs if you asked and cleaned our dishes from our table at a timely manner. The front desk staff were very helpful especially when we decided to extend our stay by adding one more night. We did enjoy the evening reception time when we were at the hotel at that time. The laundry facilities are in the 3rd,6th and 9th floor for $1,75 each. The only problem with the laundry facilities is they only had 1 washer and 1 dryer on each floor and you had to wait. The little shop at the hotel has lots of options if you forget something at home or you can walk or drive down the street to the Target. The shuttle pick up and drop off was just in front of the hotel and served all 3 Hilton hotels. The down side is that it dropped you off in A4 and the walk is longer than the ART drop off. It was a great stay, Embassy Suites just needs to update all their rooms not just half the rooms in the hotel. This hotel was at the high end of our budget, but it was the only one with availability the days we needed since we booked a little late. For what we paid, I had high expectations, and was sorely disappointed. We had a queen suite for our family of 5. From the moment we walked in, there were issues. The beds were not queen size. They were full size at best, and a tight fit for 2 people! The sofa bed was a hard, springy flat mattress that was horrible to lay on. The bathtub wouldn't stay plugged, so I had to put a washcloth over the drain so it would fill up. The coffee maker, which we did not use, leaked water randomly all over the counter and got on our stuff. The dresser in the bedroom had two drawers that stuck. The hotel only has 4 elevators, so they were always packed and you had to wait (stairs were not easily accessible as an alternative). We did mention to the front desk the issues with the tub and the dresser, nothing happened. The only things we liked were the breakfast (lots of variety, good food), and the shuttle service to Disneyland was punctual and the drivers were great. I don't feel like we got our money's worth, and absolutely would not stay here again. I hope the next time we go to Disneyland we can find a better hotel! We always stay in Garden Grove and this is our second time staying here. hotel was clean, breakfast was filling and all you can eat one of the few hotels that offers bacon. nice little on site gift shop and within walking distance of some great restaurant and shops. bus picks up in front of hotel. Embassy suites delivers consistently for our family of 6. We can all stay in one room. The breakfast is superb. They offer evening drinks and snacks. The pool area is nice and the service good. The mattress quality can be improved. But other then that they offer a good product and service. The shuttle option to Disneyland is great. So I am only giving this hotel a 3 because it was close to Disneyland. Other than that this was a super small room and bathroom for a really high nightly price. The carpets were dingy and looked dirty in the hallways and in the rooms. The beds were not very comfortable. The breakfasts in the morning were very delicious! First time taking my 2 girls to Disneyland. They enjoyed staying in the room as much as they did Disneyland. They loved the fact that they had their own space, a warm pool to swim in, and whatever they wanted for breakfast. The staff was great too, very informative about what was going on in the area and in Disneyland. I will be back next year. Our stay was near perfect with the exception of the first room we were assigned, the air did not work. I called down to the front desk and they sent up maintenance right away who then determined the pump was out. They sent the bellhop up and moved us to another room within 30 min. Everyone was extremely welcoming and friendly, with the exception of the one lady working the desk where they sold the Disneyland tickets. . The room was clean and comfy and everything went just like I expected. We will stay here again. We've stayed at this hotel a few times in the past and really enjoyed it. This time, however, it was evident that they have done some MAJOR cutbacks on quality and service. The hotel, in general, was filthy. The restroom in the lobby was disgusting with dirty toilets, floors and sinks. It appeared it hadn't been cleaned in a VERY long time. Our room, upon checking in, had all the dirty linens and dirty dishes from room service right outside our door. We had to step around the pile to get in. There were no linens for the pull out sofa even though we had one king bed and four registered guests. We waited an average of 10 minutes each time we wanted to use the elevator. Most disappointing, however, was the horrific breakfast. In years past, there was a hostess who seated your party, brought your beverages, and refilled them. The previous buffet was bountiful with a large selection of quality and delicious food. This time, several groups were competing for the same table that was actually bussed and available. It was a free-for-all, every man for himself, and you had to run to try to get a table to sit at while balancing your cafeteria-style tray with food. There were no hostesses to collect your buffet coupon you received upon check-in so anybody and everybody could come to the hotel and eat breakfast for free. This was evident by the hundred or so people there at any given time. There were only two bus people for the few dozen tables they had. So while most tables were occupied,, the few that may have been available were dirty. They were often times out of clean plates, coffee, sugar, or food. The omelet line was not even an option as they only had one poor chef and a line of about 20 people waiting for their cook-to-order eggs. The other buffet food was borderline inedable with very few options of low-quality food. We were so disappointed, we actually ended up eating elsewhere even though the buffet was part of our package. Even the coffee was undrinkable as it was weak and bitter. The "restaurant" was overall very dirty. We have been to Disneyland about 12 times and this, although previously considered very good, was by far the worst hotel we have stayed at and will never stay there again or recommend it to any friends. We have stayed at a lot of hotels by Disneyland, but this is our favorite so far. We loved the breakfast and enjoyed the omelet station each morning. We loved the extra space and the wetbar in the living room. Our family had the best time at the Embassy Suites. Our kids loved the breakfast and having "their own" room that even came with a sink. The beds were really comfortable and the bathroom had a lot of counter space. They thought it was so cool that there were pond with live fish and turtles in the lobby. We loved it. This was the first time we stayed at this hotel and was VERY DISAPPOINTED!! We travel frequently to the Anaheim area and this hotel has been the worse I have stayed. During our 4 night stay these are the issues we encountered: 1. Hotel lobby and outdoor was dirty. There was trash outside the grounds and this was consistent not just on occasion. During the early afternoon everyday the hotel floors are filled with dirty laundry and trash bags outside of most rooms (This is their way of cleaning the rooms) and looks awful and gross, especially when you are trying to walk down the hall with a ton of trash and dirty laundry at each door. 2. I hope there is never an Emergency at this hotel because all the Emergency plates I looked at were worn out and you couldn't tell where you were, 'You are here', on the map or where the stairs are located. I hope the Fire Dept does a surprise inspection soon to correct these. 3. The staff says they prize themselves on expert customer service but I experienced terrible customer service. Every employee I interacted with was not very friendly or courteous: All except one amazing bell man that helped us check in and greeted us every time he saw us. 4. Hotel breakfast is NOT worth the time and money (yes it was free). It seems every other dish we got was dirty: food still on plates and forks, lipstick on glasses. The food was ok but nothing great: not worth the time going down to it, see #8. I was looking forward to the made to order omelettes but both times we ordered them they were runny and again not worth the wait. 5. Don't have anything sent to the hotel, they couldn't find it when I went to pick it up. Luckily after several attempts and waiting 20 minutes, they finally found it. 6. Resort Transportation is terrible. The location of this hotel is not close enough to walk to Disneyland and the hotel transportation is a small single bus that services 3 large hotels. It makes 2 trips per hour and several times we had to wait because it would fill up so quickly. The transportation drivers were also rude and didn't seem very happy to be there. I am not a huge fan of the ART (Anaheim Transportation) but it is much better than the hotel transportation. 7. My room keys had to be re-keyed 8 times on our 4 day trip. They were rude and tried telling me it was my fault for keeping them 'by my phone', near a 'magnet', near 'electricity', 'in my purse'. I have stayed in several Anaheim hotels (~8 times a year for the last 5 years) and I have NEVER had this problem at any other hotel. The last time they keyed it they used a different type of key and magically it worked for a whole 2 days without needing to be re-keyed. 8. You think the lines are long at Disney, wait till you need to use the elevator at this hotel. With 13 floors and 30 some rooms per floor, they only have 4 elevators and the whole time during our stay there was at least 1 elevator out of service: leaving only 3 elevators (for over 400 rooms, ~1600 people). Trying to get to the first floor or back up to your room on the elevator could easily take 20-30 minutes, especially during breakfast, check-in and check-out times. It makes it even worse when they have booked large groups that they spread out on several floors and they continually using the elevators to go between floors. 9. Was at the restaurant and asked to have the food just sent to our room. They sent our food that they over charged, added a service fee that was not disclosed, and sent the wrong food and drink. The food itself was definitely NOT worth the price! The food was pricier than what you can get at Disneyland and not as good! 10. The Wi-Fi should be called Wi-Iffy because sometimes it works and sometimes it doesn't. My advice don't waist your time and money staying at this hotel!! I traveled last week with a group of 72 teens and 19 adults for a choir tour, we stayed at this hotel and they were so friendly, and accommodating! They had our room key cards all divided out to just hand out. They were lightening quick to bring up more towels, blankets, and pillows when we called them and they allowed our bus drivers later check out so they could rest before our all night drive home. They had several other large groups of teens but the staff didn't seem at all put out by noisy and active kids, but treated us all like like old friends. The breakfast was fantastic and there was never a long line. Everything was very clean and well kept. 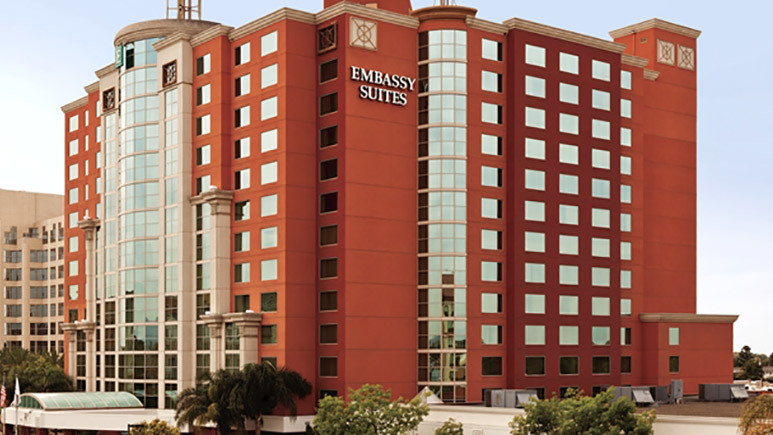 Our choir group ALWAYS stays at Embassy Suit properties and this location is defiantly a prime example of the quality we expect from this chain. This Embassy Suites is great with their bigger rooms, and hot breakfast buffet. The best part about this hotel according to my kids is the roaring lion that lives there. (It's not a real lion, but it roars every hour in the atrium.) We like that this is the closest Embassy Suites to Disneyland.